Teachers in Denver are poised to strike for the first time in 25 years starting Monday. Here’s a breakdown of how the strike will impact DPS, teachers and families. Denver Public Schools and the Denver Classroom Teachers Association will try to reach a last-minute deal to avert a planned strike on Monday. Both sides are scheduled to meet Friday night to discuss how much teachers should be paid, both in base pay and in incentives. If teachers do strike Monday, the district has said schools will remain open. However, earlier this week, DPS announced that early childhood education classes would not be held. DPS said that would impact 4,714 ECE students – 71 percent of whom qualify for free or reduced-priced lunch. DPS said it’s recruited more than 300 guest teachers. That’s in addition to the 1,200 already on the active roster this year. Each day that teachers are striking, DPS estimates it could cost over $400,000. That includes the cost of paying substitute teachers, the amount paid to provide strike curriculum and materials and the loss of ECE revenue. All together, Denver teachers and Special Service Providers (SSPs) are paid $2 million a day in compensation. A striking teacher would lose, on average, $400 per day in pay. Substitutes would be paid double the regular substitute pay during a strike, $212 a day. Retired teachers would be paid $250 a day. The district put together a guide of what parents can expect if a strike should occur. 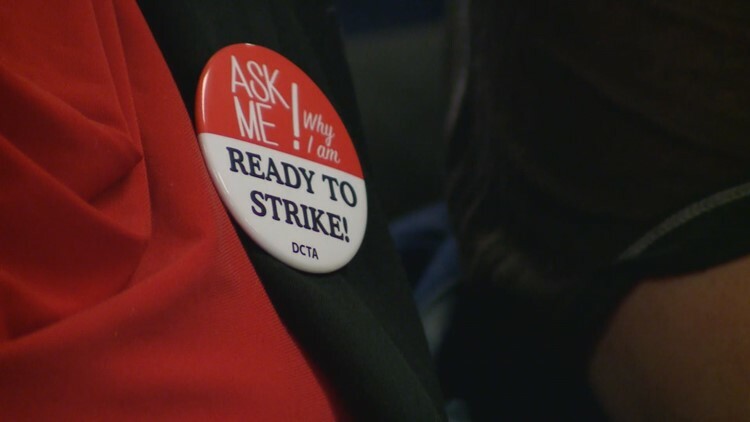 In it, DPS answers commonly asked questions surrounding the strike. The guide also gives tips on how families can prepare for the strike. The district also has a family helpline to answer questions. It's open from 8 a.m. - 4:30 p.m. The number is: 720.423.3054.